From Dead Mouse Productions Ltd and Cult Screenings UK Ltd, makers of Leviathan: The Story of Hellraiser and Hellbound: Hellraiser II, You’re so cool, Brewster! The Story of Fright Night and RoboDoc: The Creation of RoboCop and John Campopiano, director/writer of Unearthed and Untold: The Path to Pet Sematary comes this brand-new documentary Pennywise: The Story of IT. A fully independent retrospective into the making of Stephen King’s IT and its cultural impact over the last 28 years. 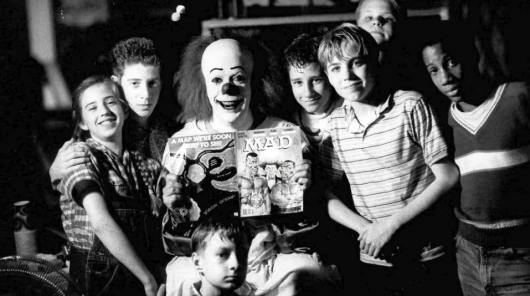 Supported by dozens of the original cast and crew including Tim Curry, Tommy Lee Wallace and Bart Mixon Pennywise is made by fans of the IT for fans of IT. The crew have already received support from over 20 of the cast and crew, including acquiring over 2 hours of never-before-seen set footage from SFX wizard Bart Mixon, as well as loads of archival and behind-the-scenes photos and there is no doubt that by the time of production many more key players will be attached to share their amazing stories about one of the most iconic movies ever-made. The documentary was written by Campopiano, and is directed by Chris Griffiths with Adam Evans helping as assistant director. Pennywise: The Story of IT will be released sometime later this year. Upcoming documentary from the makers of You’re So Cool Brewster: The Story of FRIGHT NIGHT and Unearthed & Untold: The Path to PET SEMATARY about the making and legacy of Stephen King’s 1990 miniseries, IT. Starring Tim Curry, Seth Green, Richard Thomas, Emily Perkins, Bart Mixon, and many more, this documentary will dive into the clown that terrified a generation.